Black Diamond PosiWire Quickdraw. A super-versatile draw with a snag-free Positron keylock carabiner on top and HotWire wiregate on bottom. 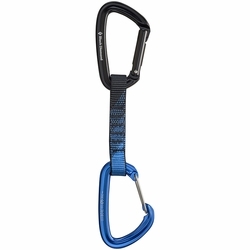 With a snag-free Positron carabiner on top and a lightweight, easy-clipping original HotWire carabiner on bottom, the Black Diamond PosiWire Quickdraw combines smooth clippability and wiregate functionality. The 14 mm (.6 in) Polyester Dogbone is not only durable and easy to grab, but it features our Straitjacket insert to keep the bottom biner in the optimal clipping position.